You've probably waited in line outside Pink's hundreds of times at this point, mostly around 213a, and ARE YOU SURE THE DARKROOM ISN'T STILL OPEN? LIKE TOTALLY SURE? OK WE'RE DEFINITELY GOING TO PINK'S. Despite all that time there though, there's actually a ton of stuff you still don't know about your favorite hot doggerie, so we hit up their owners (whose last name is Pink -- see, there's one thing you didn't know!) to make you an expert, even at 213a. Also, they gave us $100 in free hot dogs to give away. So… tweet THIS, and maybe we'll give you some of it. 1. 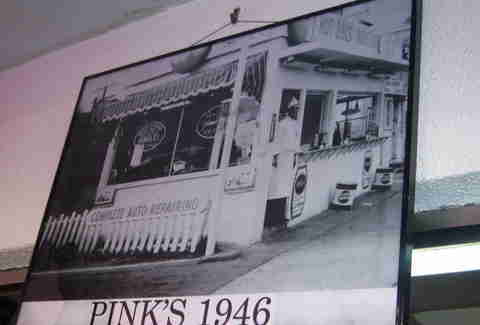 Pink's got its start as a rolling cart in 1939, which they paid $50 for. Now, for $50, you can buy 12.5 Guadalajara dogs, which's totally worth it. 2. 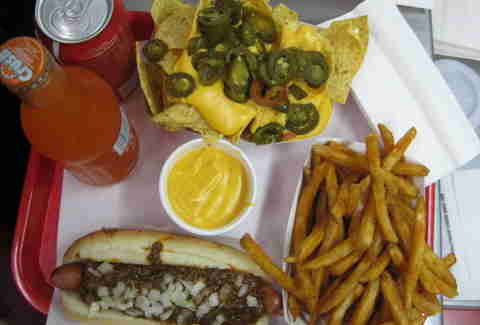 The most Pink's dogs to ever be eaten in one sitting was by Orson Welles, who downed 18 of these suckers. Followed by his bowels experiencing their own War of the Worlds. 3. 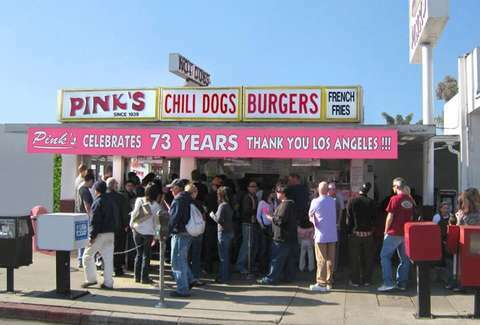 Pink's is officially a city-recognized "Treasure of LA". 4. In 2006, Sports Illustrated shot some of their Swimsuit Issue in Pink's dining room. 5. 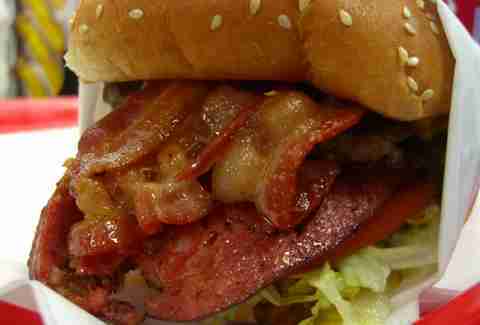 When Pink's originally opened, they didn't have any power, so they plugged into a neighbor 100 yards away. 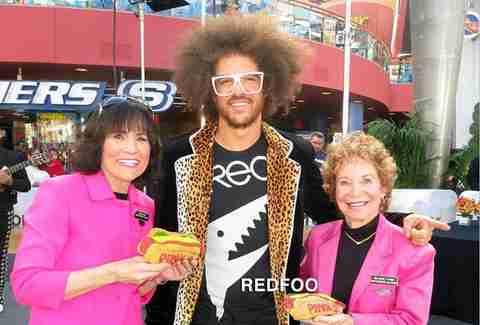 Instead of borrowing some from Redfoo. 6. 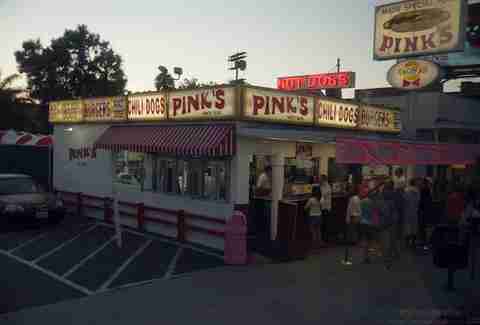 Famous movies/TV shows that have shot at Pink's: Hell's Kitchen, Mulholland Drive, Jackass, The Today Show, House of Lies, Huell Howser, and Leno. That vid above? That's Huell and Tony Danza from 1981. Aw yeah. 7. 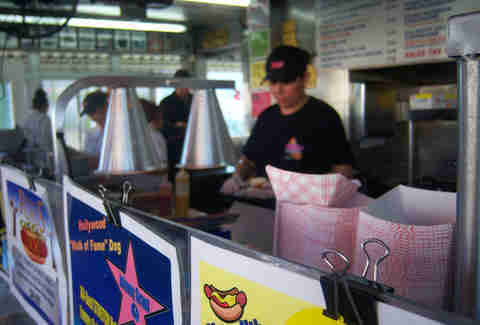 Pink's goes through between 1500 and 2000 hot dogs a day. Insert innapropriate hot-dogs-going-through-pinks joke here. 8. 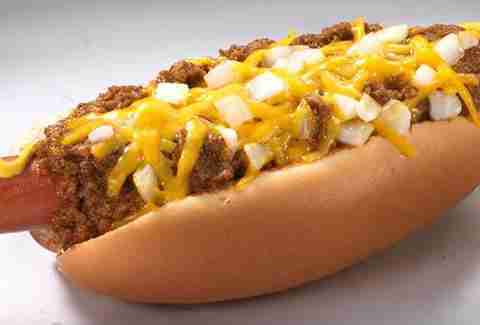 The "Martha Stewart Dog" (stretch dog, relish, onions, bacon, chopped tomatoes, saurkraut, sour cream) was named for Stewart after she waited in line herself to order it. Later, she shipped 350 of 'em to NY for the audience at her show. According to several audience members, they were "better than prison food". 9. Bruce Willis proposed to Demi Moore at Pink's. No wonder their relationship was a dog. Heyo? 10. Okay, we saved the best for last -- here's how much of each item they go through a year: 53,340lbs of hot dogs, 46,800lbs of chili, 51,480lbs of Polish sausage, 128,700lbs of fries, 25,025lbs of bacon, 14,870lbs of burgers, 34,320lbs of saurkraut... and 129,800 tortillas.